Most of the early film noir classics are set, if not in Los Angeles, then someplace in southern California. Think Double Indemnity and The Big Sleep and The Postman Always Rings Twice. Even when set a bit further afield, such as the San Francisco of The Maltese Falcon, the movies were shot in studios and backlots located in Hollywood. This isn’t very surprising–Los Angeles and its environs are sort of the default setting for movies of all types from all time periods. The movies that would much later be classified as film noir were just average studio projects made to put patrons in seats of movie theaters across the country. The Naked City (1948) filmed entirely on location in New York, and oftentimes out in the streets, apartments, shops and offices of that great city, bucked the studio-shot trend. Where the films mentioned above evolved from an amalgamation of 1930s gangster & detective films, pulp fiction novels, and German expressionism, Naked City takes these influences and adds in a significant does of Italian neo-realism, using not only location shots, but also using some non-professional actors in supporting roles and focusing in on “ordinary” people and their stories. None of this is new; the topic of The Naked City’s debt to films such as Rome, Open City and directors such as Vittorio de Sica has been written about by critics, writers and academics much smarter and more skilled than I. What is interesting is looking at what has become a landmark film, like The Naked City, and comparing it to a very similar film (which, from all appearances, was heavily influenced by TNC) shot just two years later, The Tattooed Stranger. Here’s the general plot of The Naked City: A young woman is found dead in New York City; responding to the crime are a veteran homicide detective, and a young WWII veteran recently transferred over the the homicide squad. At the scene of the crime, we see a 1940s version of CSI: New York. There aren’t many clues, but they take what they have and hit the pavement. We have also witnessed, earlier, the murderer dispatching his accomplice, who’s a hopeless alcoholic. The police begin their investigation by interviewing people who knew the victim, and the places that she worked and frequented. Throughout their search, their movements are followed by the murderer. Finally, it becomes apparent that the dead woman was involved in a criminal enterprise, and that one of her accomplices is her murderer. The young detective goes on a hunch and hunts down the perp, who leads him on a foot chase through New York, and meets his end in a shootout with police. The same plot could be used to basically describe The Tattooed Stranger. Certainly, details were changed and they are not exact carbon copies of each other (Tattooed Stranger adds in a love interest for the young detective in the investigation, and it drops complexity of burglary ring from The Naked City). The differences in the quality and ultimate impact of these movies are profound, though, as a more detailed look at each will reveal. The Naked City was director Jules Dassin’s next to last film shot in the U.S. before he fled the country, under investigation by HUAC and, like some many others, persecuted for his political beliefs. He had a number of direction credits under his belt already, and just prior to TNC, he had directed the prison drama Brute Force, coaxing from Hume Cronyn a chilling portrait of the sadistic prison guard, Captain Munsey. While in Brute Force Dassin is confined by the four thick, solid walls of the prison, in The Naked City, Dassin can take the action and his camera across the entire expanse of the city. We see it from the first scene of the movie, an aerial shot of the city, of the Empire State Building and Chrysler Building, taken from an airplane circling the southern tip of Manhattan. This aerial shot is accompanied by a voice-over by the movie’s producer, Mark Hellinger (as strange as it sounds to have the producer narrate some of the film, was a famous New York city columnist, along the lines of Walter Wintchell), and is followed by a series of vignettes on city life at one in the morning–a dark and empty street in the financial district–a cleaning lady in Grand Central Station, bemoaning that the world consists of dirty feet–a typesetter for a newspaper, commenting favorably on being left alone at work–a latenight disc jockey, who’s only listener is his wife–a bunch of swells at a swinging after hours party. Only after seeing these quiet, somewhat serene scenes of the city the never sleeps, well, if not sleeping, then slumbering, we see the murder that will set the story in motion. The opening montage sets the tone for the movie–throughout the film, Dassin will return to the technique, allowing us to see the case connected to the wider fabric of life in the city, while at the same time offering us fleeting glimpses into the lives, thoughts, troubles and desires of just a few of the city’s 8 million residents. It is the latter effect, the lying bare the lives and thoughts of his characters, which makes Dassin’s film different from our other “New York noir”, The Tattooed Stranger. Throughout the film, Dassin comes back to the voice-over and vignettes, constantly expanding the viewer’s horizon to the city as a whole. 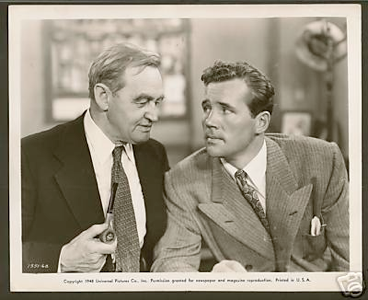 The two lead characters of the film, Detective Lieutenant Dan Muldoon (Barry Fitzgerald) and Detective Jimmy Halloran (Don Taylor), could easily descend into typical stereotype and flat characterization: the Irish-immigrant veteran detective who has seen just about everything the City has to offer, and the young, wet behind the ears pup just promoted from the beat. Dassin gives each extra texture, though, showing Muldoon humming to himself and making breakfast at his apartment. Particular attention is paid to young Detective Halloran’s home life, not only his young pretty wife, but his young son as well. The sequences involving Halloran at home have a very non-noir, mundane feeling to them, showing a couple dealing with the realities of new parents everywhere. The Hallorans are, in a way, juxtaposed with another set of parents in the film, Jean Dexter’s, Mr. & Mrs. Batory (Jean changed her name on moving from rural New Jersey to New York to something less “ethnic”). We meet them as they are taken to the morgue by Muldoon and Halloran to make a positive identification of their daughter’s body. Mr. Batory (Grover Burgess), a gardener from New Jersey, has the morose silence of a man facing one of the most horrific tasks imaginable. Paula Batory (Adelaide Klein) is the exact opposite–expressive and emotional, she reveals the deep hurt that Jean had inflicted on her parents. After leaving home and changing her name, Jean rarely called and almost never saw her parents; her daughter, Mrs. Batory says, was always too concerned with living beyond her means, always ashamed of where she came from, always too selfish to think about how her actions may impact her parents. Paula Batory’s resentment and animosity come seething through the screen. Yet they melt away in an instant, when they enter the identification room, and the nurse pulls back the sheet on Dexter’s body. Overcome with the sight of her daughter lying dead, Mrs. Batory breaks down; in that instant, Dassin gives us a glimpse of real, conflicted emotions inherent in any human relationship. Dassin takes the action of the film throughout the streets of Manhattan, from visiting rich doctors in Midtown, to talent agents in the Bowery; from the subway out to Queens, to the teeming tenements of the Lower East Side. He gives the viewer a sense of place, a sense of continuos energy; even though the city may be crowded and teeming with life, there is always a semblance of order amidst the chaos. Pounding the pavement and wearing out shoe leather, Halloran finally gets on the trail of the suspected murderer, a former wrestler Wille Garzah (Ted de Corsia); meanwhile, Muldoon has spent his time attacking the case from the other side, unraveling the burglary ring led by Dexter (and which employed Garzah in committing the actual crimes). Thus supplied with both a suspect and the motive, the movie careens on to a suitably exciting denoument. The film ends with yet another montage; with the Dexter case solved, we see New York’s newspapers moving on to the next big case, the city’s people turn their attention to their summer vacations or the Yankees. It’s a brief meditation on the fleeting nature of what constitutes news, and it’s striking if only because it may be more true today–with our 24 hour news cycle, blogs galore, and 300 television stations–than it was in 1948 (time to move on to the next young, pretty, missing blonde). Yet Dassin also shows those people on whom Jean Dexter made some impression–young Jimmy Halloran, her friends, and finally, her parents, sitting on a porch in the country on a warm summer evening, miles and miles from New York, but connected to the naked city through tragedy. The Tattooed Stranger on the other hand, is a thoroughly conventional film noir that gives you a very different sense of New York than The Naked City. As has already been noted, its plot is suspiciously close to the one from Naked City; unlike The Naked City, though, The Tattooed Stranger has a director (Edward Montague) who’s later claim to fame would be directing episodes of the television series McHale’s Navy and a lead actor (John Mills) who would never work again. Aside from a distinct difference in talent, the film, unlike the previous, takes place not in Manhattan for the most part, but in the outer boroughs. While the shots of the city in The Naked City are teeming with life, the streets and businesses of The Tattooed Stranger are strangely silent. It’s almost as if the action and scenery of each movie mimics the importance of the case–while in The Naked City, the murder of Jean Dexter is front page news, in Tattooed Stranger, the murder of the unnamed woman (with a Marine corps tattoo on her arm, hence the title), is relegated to an inch of column space on the inside pages of the paper, right below the crossword puzzle. The case begins with the aforementioned tattooed woman, found dead from a shotgun blast in a car located in Central Park. Veteran Detective Corrigan (Walter Kinsella) responds to the scene, and oversees the CSI examination of the site. Back at the Homicide Bureau, he’s told that his partner on the case is a transfer to the squad–newly minted Detective Frank Tobin, who had previously worked in the NYPD technical bureau, who served as an MP during the war, and who went to college in the intervening years. From the start, we see Corrigan’s adherence to old fashioned shoe leather detective work, while Tobin goes in for the more technical side of the case, which is rich in interesting features–the woman was killed by a shotgun blast, but not by buckshot or a slug. Instead, the murderer filled a shell with compressed sand, not wanting to leave any evidence of where he bought the ammo. Also, since there was no other damage to the car (stolen the day before), it was obvious that the woman was killed someplace else; that someplace else had its own unique features, including a strange piece of plant matter adhering to mud on the woman’s shoes. The movie soon takes Corrigan and Tobin to the Bronx docks, where they find the tattoo artist who gave her the ink–they find her name, and the last place where she worked. They also find out that it was actually a double tattoo–she had an anchor put on first, then a time later, she had the globe added, to make the Marine Corps emblem. It soon becomes apparent, through the shoe leather side of the investigation, that she had been marrying multiple men deploying overseas during the war, and collecting their benefits when they died. (Nothing like a little insurance scam–just ask Walter Neff). Corrigan hits the streets to flesh out this thread of the investigation, while Tobin meets a beautiful young botanist (Patricia Barry) and starts on the task of identifying the strange grass on her shoes, and where it may have come from (and hence, where the murder scene was). As with Halloran in The Naked City, Tobin eventually tracks down the subject on his own, and goes after the criminal. The ending of The Tattooed Stranger is handled much less deftly and much more conventionally than in the earlier movie, and when it’s done, you’re left with the feeling of seeing an entertaining movie, but not a great one. At the end of the day, that’s probably all that one can expect from a B movie like The Tattooed Stranger. It was meant to entertain, on the cheap, and the director obviously didn’t have the aspirations (or skill) of Jules Dassin. Two movies about Manhattan, with very similar general plots–in their differences, they show the diversity of film noir, and provide a nice point-counter point to each other. Note: One last note–the academic film noir historian Alain Silver called The Tattooed Stranger “one of the seediest films ever made” in his classic Film Noir: An Encyclopedic Reference to the American Style. While I certainly wouldn’t call the movie elegant, his definition of “seediest” and mine are vastly different.